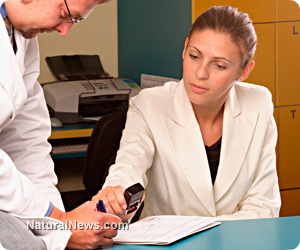 (NaturalNews) In some places across the US, high-cost health insurance coverage is being discarded altogether. The looming Affordable Care Act health insurance mandate seems to be inspiring constructive disobedience. Yes, doctors are now "outsmarting" this government mandated health care system and moving towards a cash only system. This is leading to more affordable, expansive care for many - as the red tape is eliminated. Quality, affordable health care will return to America, not through blind compliance to mandates, but from those who completely defy the health insurance system altogether. As doctors move toward a much simpler system, they can charge less and also spend more time caring about their patients instead of dealing with unneeded paperwork. This is exactly what's happening in Wichita, Kansas. The red tape is being cut down. This Kansas family physician, Doug Nunamaker, says he is now offering higher quality health care at a fraction of the cost after abandoning the entire money-bloated insurance system. He now effectively cuts overhead costs and charges his patients a small monthly fee, reducing medical service costs across the board. Tired of all the red tape and insurance paperwork over the last five years, 32-year old Nunamaker decided to simplify his practice. Noticing how wasteful the system really was, Nunamaker realized that he paid an entire staff to manage health insurance red tape. By ditching this system, Nunamaker has been able to lower costs to patients and spend more time actually caring for them. Most of Nunamaker's clients are self employed, small business owners. These patients are now testifying that a small monthly fee to Nunamaker's office is much more affordable than modern day health insurance plans (which are set to be mandated on Americans in 2014). Nunamaker also recommends to his patients that they opt to carry a high deductible health insurance plan to cover extreme emergencies that may require hospitalization. This option, coupled with Nunamer's monthly fee, continues to be much more affordable than buying into current health insurance packages. With much simpler options on the table, Nunamaker presents a more efficient way for Americans to be covered in case of an emergency and also providing inexpensive access to a wide variety of care. In this way, healthy people aren't forced to pay for another person's poor lifestyle choices (like under Obamacare). Nunamaker's way also prevents a select few from feeling "entitled" to free healthcare. Everyone who chooses to participate pays a reasonable fair share based on age. Under Obamacare, nearly everyone, whether they choose or not, pays for everyone's universal medical expenses, necessary and unnecessary. Under the Nunamaker's basic membership plan, patients pay a flat monthly fee based on age that allows them to access unlimited "direct primary care" from medical providers that work at his practice. For example, pediatric services are accessible for only $10 a month. Adults up to age 44 only pay $50 a month. Anyone over 44 pays only $100 a month. This cash only method, which also encompasses credit and debit transactions, is bypassing hours of wasted time, bloated prices, and red tape. It effectively goes around the new "Affordable Care Act" and actually offers affordable care. For example, a basic cholesterol test only costs his patients $3, compared to a typical $90 charge brought on by an insurance company. Nunamaker is also working with professionals outside his office to create a network of coverage that includes services he cannot provide. He and a colleague have already got the price of an MRI down to $400, compared to what they were charging through insurance companies - around $2,000. Obamacare requires all Americans to pay for the stupid decisions of others, like "walking into a lamppost"
As this Wichita family physician cuts through red tape, the Affordable Care Act is poised to add more new red tape to health care, which includes 122,000 new health codes. These codes include absurdities like "injuries sustained from a turtle," or "injuries sustained from walking into a lamppost." As Americans are forced to pay for absurd medical decisions and even ones that go against their personal beliefs, many doctors across the US will have the option to defy Obamacare, giving Americans individual liberty to choose the medical services and health care they deem appropriate for themselves. As more red tape befalls America, the best doctors will lead with integrity and show some guts, adopting a more responsible form of health care. The US can move back toward a much simpler, less expensive form of healthcare. A government mandated system that caters to pharmaceutical companies is destroying true healthcare.